This resource is also available in pdf. Why is written communication important? Health information is an important part of health literacy. Clients and the community need to be able to access, understand and act on health information. A lot of health information is presented in a complex way, and is often in writing. This includes informed consent forms, public health notices and medical instructions. It is common for clients and the community to have difficulties in accessing the vast range of information they need to act on(1). The use of jargon and other technical language can intensify this difficulty. If a patient doesn’t understand what they are reading, it can have a significant impact on their health, ranging from how they take their medication, or lack of informed consent. Providing simplified and more attractive written materials helps increase client and community engagement. One way to make sure health information reflects culture and language is to have supportive policies on communication – e.g. plain language. This supports health organisations to account for health literacy in practice. 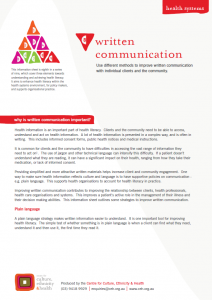 Improving written communication contributes to improving the relationship between clients, health professionals, health care organisations and systems. This improves a patient’s active role in the management of their illness and their decision making abilities. This information sheet outlines some strategies to improve written communication. Make sure you test your materials for understandability. There is so much medical jargon in the written information patients receive, it can be difficult to understand it all. Including a plain language glossary for medical terms can help the patient understand the information and make appropriate decisions about their illness. A community health centre is developing an information kit that provides clients and the community with information on the services the centre provides. They employ the plain language approach when writing the document and then test the draft with a sample of their clients during a community BBQ. The information kit is then re-drafted to include suggestions from clients, including clearer maps, and simpler language around available services. Reference: 1. Department of Health, Health literacy: enabling communication and participation in health: Background paper, State Government of Victoria, 2013.